There's an old Peruvian proverb, "Little by little, one walks far." International investors often dismiss Peru's economy in favor of South American giants like Brazil, but in reality, the country's little steps have resulted in robust growth. Between December 2010 and 2015, Peruvian stocks have outperformed Brazilian stocks by more than 10%, although both countries have suffered from lower commodity prices. Peru's economy was primarily state-controlled up until the 1990s, when Alberto Fujimori's government ended price controls, removed the restriction of foreign investment, and sold most state ownership in private companies. These reforms have led to sustainable economic growth since 1993, with the exception of the 1997 Asian financial crisis. Currently, Peru's economy is dominated by the service sector that accounts for 57% of its gross domestic product (GDP) followed by the agricultural sector's 26% share. The country is also a popular exporter of copper, gold, and zinc, with the U.S. free trade agreement helping boost trade significantly since it was introduced in April of 2006. The country's stock exchange, the Bolsa de Valores de Lima (BVL), is located in the nation's capital and houses the popular Indice General Bolsa de Valores (IGBVL) index that tracks the performance of the largest and most actively traded stocks. Notably, the index is heavily weighted towards mining stocks, as the sector represents a large portion of exports. Exchange-traded funds (ETFs) are one of the easiest ways for investors to gain exposure to Peru's economy. These funds provide broad exposure to Peruvian stocks in a single security that's traded on a U.S. stock exchange, which results in both instant diversification and ease of access through regular brokerage accounts, without worrying about foreign legal and tax issues. The only U.S.-traded Peruvian ETF is the iShares MSCI All Peru Capped Index Fund (EPU), which had approximately $108 million in assets under management. The ETF tracks the MSCI All Peru Capped Index, which consists of 26 equities with an expense ratio of 0.62%, as of December 2015. Peru is classified as a developing economy by most economists, meaning that it entails greater risk than developed economies like the United States, European Union or Canada. But the classification can also be beneficial because developing economies typically have more room for upside and experience greater economic growth rates than possible in developed nations. Improving Economic Policies. Peru's economy has come a long way since reforms began in the 1990s and maintains its investment grade credit rating. Exposure to Commodities. Peru is well known among investors for its extensive copper and gold reserves, which have benefited it in the past, as commodities have risen. Political/Social Risks. Peru's 2011 presidential elections were very close; social conflicts over natural resources remain; and, nearly a third of Peruvians still live in poverty. Concentration of Risk. Peru's exposure to commodities may have helped over the past decade, but a global slowdown could lead to reduced demand and prices. Peru may not be as popular as Brazil when it comes to Latin American emerging markets, but its economic performance over the past decade has been impressive, to say the least. 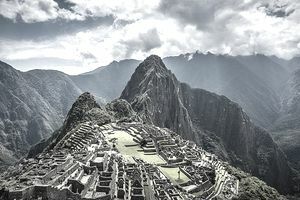 International investors seeking additional exposure to Latin America may, therefore, want to consider diversifying into Peru using the iShares MSCI All Peru Capped Index ETF (EPU).